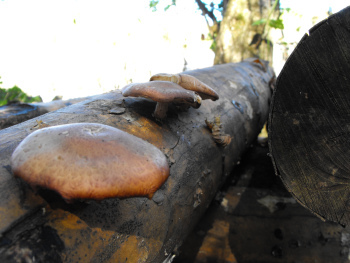 When we started our shiitake logs two years ago, I didn't do my usual exhaustive research. Some friends were buying plugs and asked us if we wanted half of the batch, so we simply followed along in their wake. Luckily, it all worked out, but now we want to expand our mushroom production and need to put a bit more thought into it. The first choice you hit when you enter the world of backyard mushroom production is species. We tried one of those box kits of button mushrooms a couple of years ago, with bad results --- our house was too cold, so we didn't get many, and it only lasted a few weeks. Since we don't have scads of free straw, wood chips, or manure, for now we've decided to stick to growing mushrooms in logs. 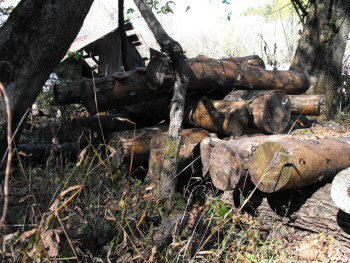 We have plenty of logs. There are two easy species of log-grown mushrooms --- shiitakes and oysters. Shiitake logs last longer (3 to 8+ years), but they also take longer before you see your first fruit (~1 year.) 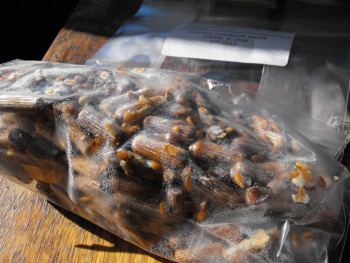 Oyster logs can fruit as soon as six months after innoculation, but the logs peter out in about two years. The two species also have to be grown on different kinds of logs --- oyster mushrooms can be grown on box-elder, which is a definite plus in our floodplain. I asked Mark whether he'd like to grow more shiitakes or try oysters. He looked at me as if I was crazy and said, "Both." When we got our last batch of shiitakes, that's all I knew about them --- that they were shiitakes. But as I explored the world of mushroom mail order, I discovered there are three broad categories of shiitakes, and many strains within those categories. I chose a Wide Range strain (JC Star) which should fruit all spring, summer, and fall and a Warm Weather Strain (Night Velvet) which should fill in the gaps by fruiting a lot during hot summer weather. I skipped the Cold Weather strain (which would fruit in early spring and late fall) for now since I wanted to be able to throw in an oyster mushroom variety too and was running out of cash. Our last choice before I could order was the type of spawn to buy --- plug, thimble, or sawdust. I have to admit that there I relied solely on past experience and bought plug. It's possible that sawdust would have been cheaper per log and faster to fruit, but I went for easy. And here they are --- our mushroom plugs ready to go in the log! Lots of questions. Can you use deadfall logs? What if you don't know the tree species? Are there different kinds of oaks which do differently with mushrooms? Where can you buy the plugs? Oh, and habitat. Sunny? Dark woods? Light woods? Can you use deadfall logs? Nope --- deadfall usually has already been colonized by other fungus species. You need to cut fresh trees, but they're pretty small. Also, I've read that Sweetgum is a good tree too, and I believe you have lots of those. What if you don't know the tree species? You've gotta know the tree species. If you're in doubt, you can ID the trees when they have leaves and mark them with flags. Some species just don't work, so you don't want to just cut down a random tree. Are there different kinds of oaks which do differently with mushrooms? I've read that the white oak family is better than the red oak family. Where can you buy the plugs? There are all kinds of places on the internet. We ended up buying from Field and Forest Products (http://www.fieldforest.net/store/index.php?main_page=page&id=3&chapter=0) since they had good prices and a really good selection. Oh, and habitat. Sunny? Dark woods? Light woods? You'll want to put them someplace where they have shade in the summer but are really close to water since you'll dunk some every week starting the second year. If you're willing to walk down there every day or two to check on them, you could put them by your beaver ponds. Alternatively, you could buy a kiddie pool and put them under a shade tree by your house. can i grow shiitake/oyster mushrooms under my apple trees. my apple trees have a bark mulch around the bottoom(about 4 inches deep). Are you hoping to grow the edible mushrooms in the mulch or just use the shade of the tree to house your mushroom logs? If the latter, you can definitely grow mushrooms under your apple. If the former, I'd have to say that you might not have much luck. Even though the mulch under your apple trees is wood chips and you can grow some mushrooms on wood chips (oysters more than shiitakes), mulch and mushroom substrate are a bit different. The former should be at least somewhat decomposed, while the latter needs to be fresh. You'd also need to keep the mulch pretty damp to grow mushrooms there, which might be too much moisture for the apple trees. I tried growing King Stropharia mushrooms in fresh wood chip beds just past the mulch zone of my fruit trees last year and even that didn't do well --- I probably would have had to water the mushroom beds a lot to get good yields. You might be able to grow morels in the earth under the apple trees, but my understanding is that we haven't really figured out how to get morels to fruit consistently yet. We put a few plugs in the ground a year ago and are keeping our fingers crossed, but aren't holding our breath.